You can define recipients, conditions for recipients, queues, and distribution lists for a message. Condition Click the three dots next to the condition text box to define a condition for which users the message is sent to. Click the three dots next to the recipients list text box. Use the Select Type drop-down menu to filter the recipients list. Select at least one recipient for the message. Define the recipient's Role and Hierarchy. Direct: Users assigned to the selected role in the current department. X2: Users assigned to the selected role, located one level up in the organization. X3: Users assigned to the selected role, located two levels up in the organization. Top: Users assigned to the selected role, at the top of the organizational structure. Queue Mode This option is for messages that are part of a task, and if you selected more than one recipient. Select a queue mode to distribute the message. Default: The task is sent to all recipients and any recipient can complete the task. Auto Fetch Current User Queue: If one of the users in the queue is the user that completed the previous form, the task is automatically fetched to that user..
Load Balancing Queue: The task is sent to the recipient with the least assigned tasks. Broadcast Queue: The task is sent to all recipients and only the recipient that fetches the task can complete the task. IMPORTANT: If you select a queue option, you can only select one distribution list. You can define message recipients by user, group, external user, process role, or employee role. 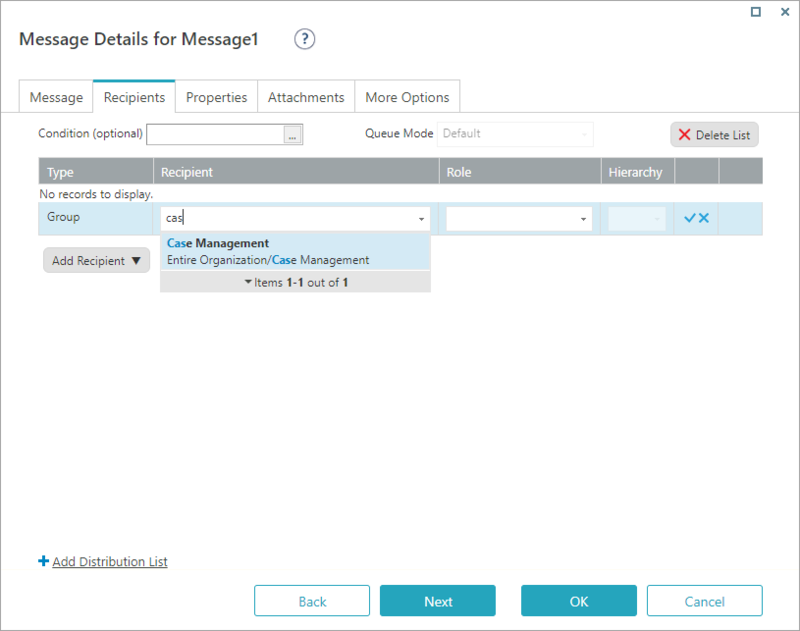 Condition You can set a business rule to determine conditions for when to send the message to the specified recipients. Group: List of the groups defined for the organization. Group Expression: Create an expression to define the required group, or multiple groups. User: List of the users registered in the system. User Expression: Create an expression to define the required user, or multiple users. External User: Enter an email address, or multiple email addresses separated by commas. You can also use an expression that returns the required email addresses. Process Role: Set recipients by their role in the process: creator of the message or task, or recipient of the message or task. Employee Role: List of the employee roles defined in the system. Recipient Displays a list of options depending on the type of recipient that you added. You can also enter an expression. Role Displays the employee roles defined in the system. Hierarchy Displays a list of hierarchy options. Direct (default): Send message to the selected role. X2: Send message to a recipient located one level up in the organization. X3: Send message to a recipient located two levels up in the organization. Top: Send message to a recipient located at the top of the organizational structure. Queue Mode This field is available only for task messages. Auto Fetch Current User Queue: If one of the users in the queue is the user that completed the previous form, the task is automatically fetched to that user. Add Distribution List Adds an additional distribution list. IMPORTANT: If you select a queue mode, keep only one distribution list. On the Recipients tab, to insert a recipient, click Add Recipient, and then select a recipient type. Define the recipient according to the recipient type you selected. 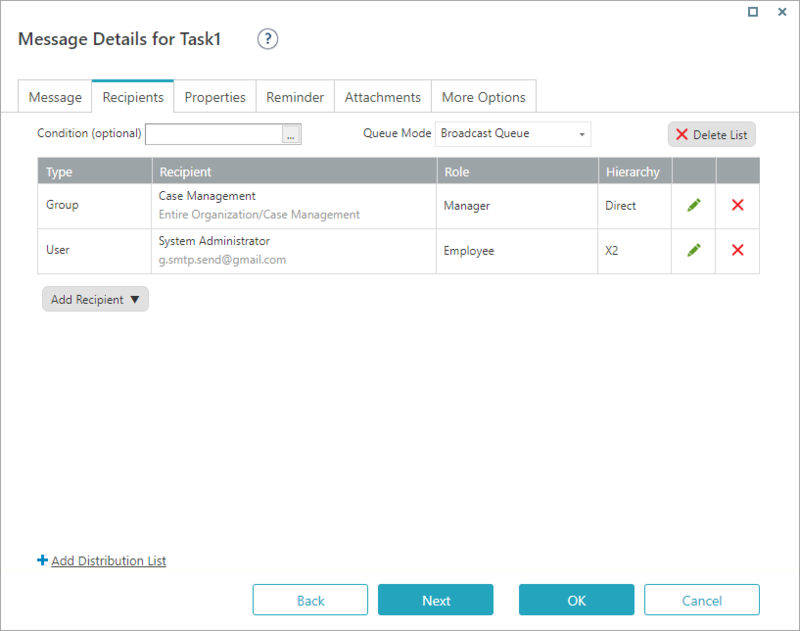 Assign a role for the recipient or recipients that you selected. Assign the required hierarchy level. To confirm the recipient settings, click the insert button ( ). The recipient row is added. You can add additional recipients or start a new distribution list.